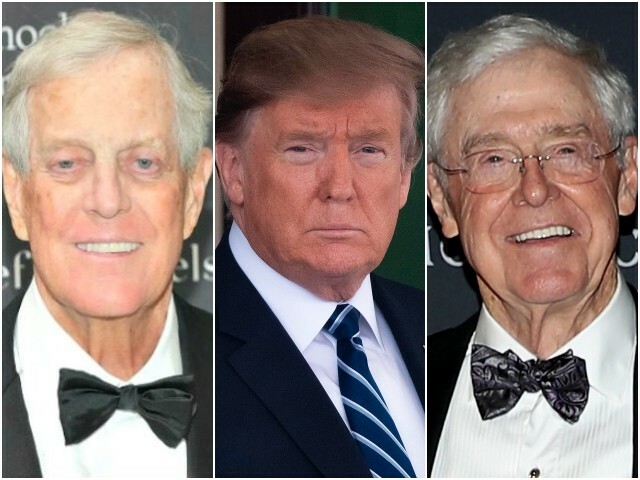 The pro-mass-immigration Koch brothers’ network of billionaire, donor-class organizations is fighting President Trump’s economic nationalist agenda ahead of the 2020 election with efforts to give amnesty to illegal aliens and a campaign for free trade absolutism. While Trump scores victories from his tariffs on Chinese imports and imported aluminum and steel, and from the increased interior enforcement of immigration, the Koch network of organizations — including Americans for Prosperity, Freedom Partners, and the Libre Initiative — is looking to crush the populist-nationalist gains with an unpopular economic libertarian agenda. On the immigration front, the Koch-funded Libre Initiative brought illegal aliens, who were shielded from deportation by former President Obama’s Deferred Action for Childhood Arrivals (DACA) program, to Washington, DC, last week to lobby vulnerable lawmakers to support a DACA amnesty. Spokespeople for the Koch network were previously invited to the White House by advisers Jared Kushner and Brooke Rollins to lobby on behalf of illegal aliens for an amnesty that would subject 13 million unemployed and under-employed Americans to more cheap, foreign competition in the U.S. job market. The Koch network is seeking to secure an amnesty for more than a million illegal aliens enrolled and eligible for DACA by pushing the White House to negotiate a large immigration deal, insiders have told Breitbart News. While the Libre Initiative is laser-focused on amnesty for illegal aliens, other Koch-funded organizations are invested in stripping Trump of his power to executively enact tariffs for the purpose of national security and to protect American industry and U.S. jobs for the country’s working and middle class. The effort is being fronted by Rep. Mike Gallagher (R-WI) and Sens. Pat Toomey (R-PA) and Ben Sasse (R-NE), who are hoping to ensure endless free trade by preventing the executive branch from enacting certain tariffs without going through Congress first.